Software engineers came up with an award-winning hack for the company’s urban farm and won a meeting with Microsoft President Brad Smith. Urban farming is a curious offshoot of Microsoft employees’ efforts to make advances in cloud computing. Microsoft has eight contract farmers who use the company’s PowerBI and Azure platforms to collect and share data about a crop of lettuce that grows in 55 hydroponic towers interspersed across the Redmond campus. The pilot program started in 2013. Today the annual harvest totals 15,000 pounds lettuce and a ton of micro-greens including basil, cilantro and kale. The 2,000 cooks and other employees of contract dining services provider Compass Group USA pick the greens as they’re needed for use in some of the 40,000 meals served each day. 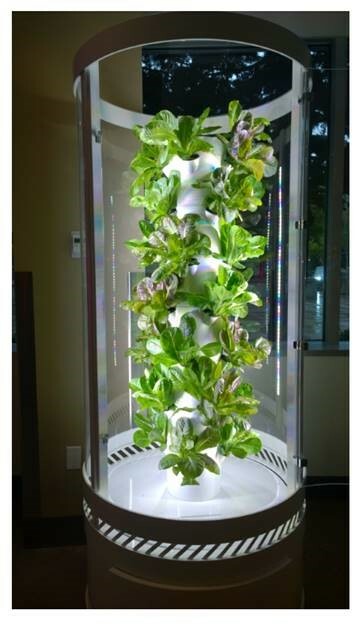 For Microsoft Corp., it’s a way to boost employee health and wellness and reduce food waste, both of which resonate with employees whose interest in the farm was piqued long after the initial grow towers had been placed in a cafe and bathed in LED lighting with a brightness that draws people in. “They were taking selfies with them and bringing in friends to show them what we were growing,” said Mark Freeman, Microsoft’s senior manager of Global Dining Services. “It’s a place where developers go and fiddle with stuff in their spare time,” Freeman said. Every Wednesday night, around four dozen people met with Schilke to talk about ways they could help. Work continued during Microsoft’s “//oneweek Hackathon,” when a team came up with sensors that measure and transmit pH data, nutrient levels, humidity and temperature readings and lighting levels in the hydroponic towers. The innovation won the hackathon’s industrial category and an hour-long meeting with Microsoft President Brad Smith. “It was fun to pitch it to him,” said Freeman. Microsoft Azure cloud computing platform and PowerBI data visualization program are used from seed to harvest. Microsoft said the entire growth process represents a model for SaaS business intelligence, combining hardware, software, data storage and monitoring in a streamlined system. Freeman said the company is looking at expanding the farm and talking to Microsoft teams in China, France and Ireland. The farm operation isn’t as cost-efficient as buying produce from wholesaler, Freeman said, and he’s OK with that.